What do iPods and thermostats and WiFi have in common? The answer is Nest. 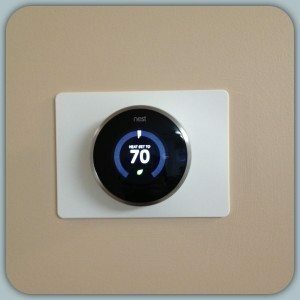 The new thermostat is designed by Tony Fadell, who invented the iPod. Okay, he didn’t do it singlehandedly–but the former Apple executive conceived it, got Apple on board, and then went on to shepherd the development of 18 (!) generations of the company’s signature pre-iPhone product. In 2008 he left Apple and several years later founded a stealth startup called Nest Labs, which was revealed this year to be in the… thermostat business. We at Seasons of Smiles Dental love anything technologically related, and we just had to try this out at the office. We have only been using the thermostat for this last week, and we give it five stars (*****), out of five. We haven’t learned all the bells and whistles, but we are loving all the features, and especially appreciating it for its ease of use. The idea with this thermostat is that it connects to the office WiFi, and from there connects to the internet!!! OK, I can almost see my wife rolling her eyes, but this is exciting. Last month I needed to come in to the office on a Sunday. I had to come in a few hours early to turn on the Thermostat for the office to heat up in time for our patient. In the future, with this feature, I will be able to bump the thermostat from the house a few hours ahead, or if I’m on the road, I can adjust the thermostat from my smart phone. iPhone Screen capture is showing the installation for our office. The installation was easy enough. I can’t even began to image all the different combinations of heaters and air conditioners that are out there. When I installed the thermostat, it almost felt like it was custom designed for our office heater and cooler system. The directions were easy enough to follow. I did have some questions, and I wanted to talk to a real person. Nest Labs provided a installation phone number that I could call. They were easy to get a hold of and answered all my questions. I love easy phone tech support. It was just as easy and pleasant to talk to them as getting a hold of Apple’s tech support. Sometimes computer related stuff can be so much trouble to work with. Our old thermostat we had before was programmable, It has been a few years since I last programmed our last thermostat and it needed to be reprogramed again. I couldn’t do it. I went and dug out our old manuals. I went through the motions of pressing all the buttons, I finally gave up, and I just continued to control the thermostat manually, bumping it on when we came in, turning it down when the day was over. 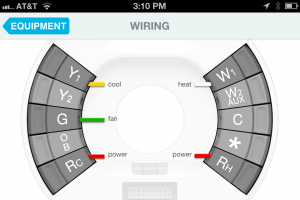 Controlling Nest Labs Thermostat through WiFi. 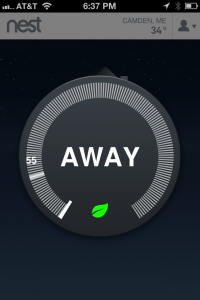 Controlling the Nest Thermostat from my Laptop. Click on photo to enlarge. 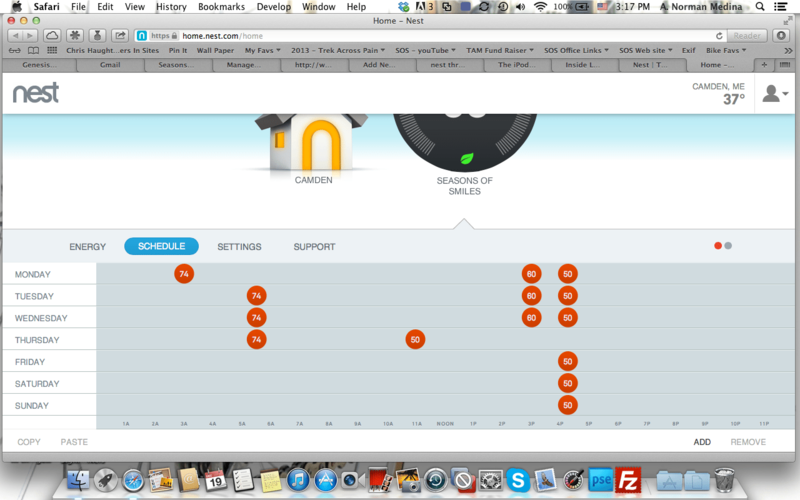 So here is what it looks like programming our new Nest thermostat from my laptop. Pure fun!!! It’s so easy sliding the little tabs left and right, turning the heat up and down, adjusting it to fit our office schedule. The browser-based software is a joy to work with. Very intuitive. I can be anywhere, as long as I have WiFi for my laptop, I can adjust the office temperature to my hearts content. Controlling the Nest thermostat from my iPhone. As you would expect, Nest Labs has created an app that can be installed on your iPhone. Here is how it looks on my iPhone. There are lots of other features not listed here, but it does the basics so nicely. As long as I can get a AT&T signal on my iPhone I can adjust my thermostat. Nest Labs claims that it will save me money by running my system more efficiently. I love the idea of using less oil. I can’t verify that yet, but taking into consideration all the other neat features, this thermostat is a pure joy. 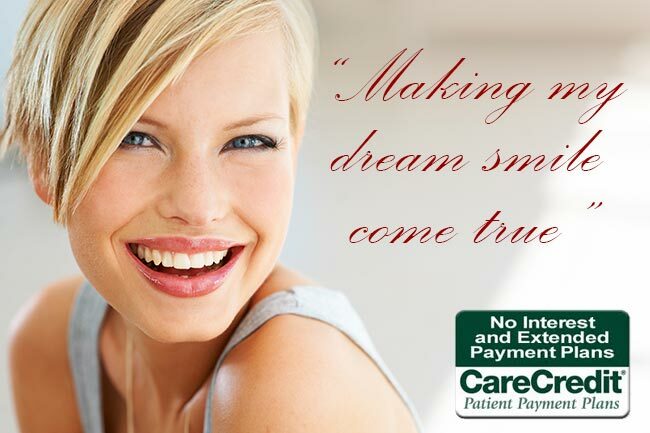 We at Seasons of Smiles Dental love technology, technology that works for you, and your teeth!!! 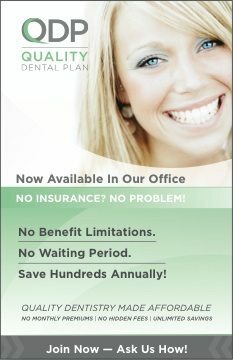 If you have any questions or concerns, give us a call at (207) 236-4740. Nest engineering is always looking to improve the performance and functionality of our products. We’re reaching out to you because you’ve participated in testing of previous versions of the Nest Learning Thermostat and we would love if you could help us once again by testing yet another improved version of the product. If you would like to participate, we would have you remove your current thermostat and have the testing hardware installed. We will reimburse you to have the new hardware installed professionally. If you are eligible and would like to participate, please contact me at 855-4MY-NEST (469-6378) +7 Ext. 2271. If you get my voicemail, please leave a message, mention your case number 01567392 and I’ll give you a callback as soon as possible. Otherwise, you may reply to this email and I’ll respond within 24 hours excluding weekends. If you have any questions unrelated to this case or what we’ve discussed so far, please give us a call at the main support number below for assistance. Hours: 7 days a week 24 hours a day. We appreciate your help! Here at Nest, we are very thankful to have such a close relationship with our customers, working with you to create the thoughtful home. We look forward to hearing from you soon! This just in. Google is buying Nest? And it’s just keeps getting better with time. A write up from CNN, I think I understand the idea. Now if we get all these neat perks in the colder areas.